The life of a key player in the world-famous mass Nazi prison escape during World War II is being remembered 75 years on from the event. 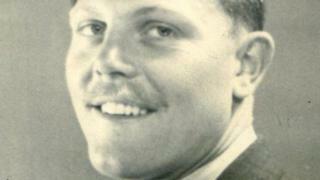 Ian Cross, from Portsmouth, was 25 when he was killed after escaping the German Stalag Luft lll on 24 March 1944. Of the 76-strong group of escapees, 73 were recaptured. Adolf Hitler ordered the murder of 50 of them. Mr Cross was recaptured shortly after the mass absconding, known as the Great Escape. He was killed on 31 March that year. He is best known for having led the so-called "penguin" team, which disposed of the soil dug up during the construction of escape tunnels. Mr Cross, of Cosham, who joined the RAF in 1936, had ended up in the Nazi prisoner-of-war camp after being shot during an attack on German shipping in the English Channel. Forced to ditch in the sea, Ian and his crew spent a whole day on a lifeboat before being rescued by German forces. Mr Cross was initially sent to the Oflag XXI-B camp, where he met Roger Bushell, the South African-born man who masterminded the Great Escape. After practising the escape at Oflag, the two were then transferred to Stalag Luft. The Commonwealth War Graves Commission (CWGC) is commemorating the group at the Poznan Old Garrison Cemetery in Poland, where 48 of the men are buried. The 1944 event is the same one on which the 1963 film The Great Escape, starring Steve McQueen, was based on. Max Dutton, assistant historian at CWGC, said: "The world knows the version of the Great Escape made famous by the film, but when you learn about the real men behind this ambitious breakout there is an even more incredible story to be told. "Ordinary men, like Ian Cross from Cosham, found themselves imprisoned with no sign of release and decided to take action to free themselves and their comrades."